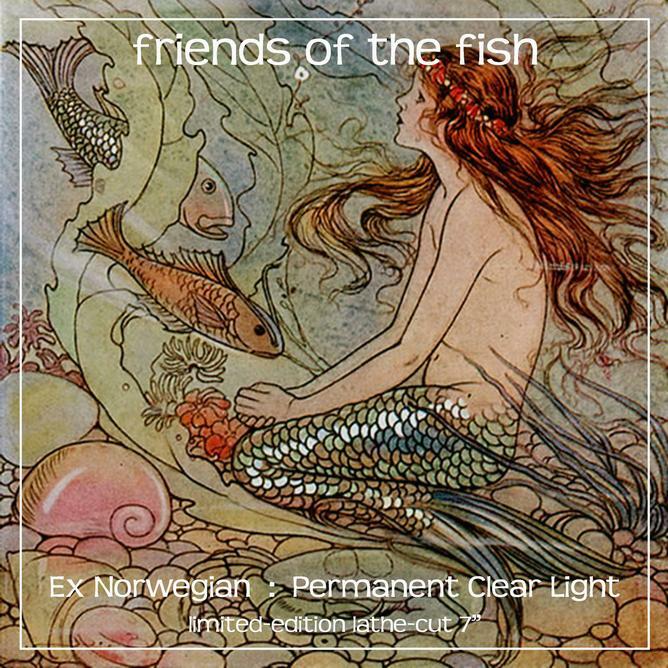 The folks at Fruits De Mer (Friends of the Fish parent label), admittedly one of our favourite vinyl-only imprints have saved something special to wrap up the year: the Christmas Day release of this Scandinavian-flavoured, limited edition, lathe-cut split 7in featuring USA (by way of Miami Beach)’s Ex Norwegian covering an old String Driven Thing track that apparently made some chart nose for The Bay City Rollers, and a new track from Finnish label stalwarts Permanent Clear Light. A taster for Ex Norwegian’s sixth album, ‘It’s a Game’ gets the power-pop treatment with cheery vocals, stomping beats, and a hearty singalong chorus. A definite earwig, I also like the nifty guitar solo they toss in at the end, too. For those keeping score at home, this one sits comfortably between the bubble gum-y Rollers version and the more Roy Wood (ca. Wizzard)-oriented original. ‘Corneville Skyline’ is also a portent of things to come, specifically PCL’s sophomore album The Other Side of Life due next year. It’s a sweet little tune that is perfectly suited for a stroll down the beach or a lazy walk through the forest on a sunny afternoon. Part Pepperism, total head-nodder, there’s lovely flutes, happy tambourines, giggly harmonies and a total blast from start to finish. What a wonderful way to wrap up 2015! But act fast, there’s only 50 of these special singles available and they’re sure to disappear quickly.